Watching Durham Bulls Baseball: So, How’s That Working Out Tampa Bay? There’s a lot of ways to count the chaotic shuffling going on in the Rays system over the last couple of days. Let's go by my count — at least 15 ballplayers have been moved around (a couple of them more than once) over the last week or so. The greatest beneficiaries of the moves appears to be the Rays and Bulls opponents. The Rays have lost 7 of their last 8 games. The Bulls have done a bit better over the same period. They’ve only lost 5 of their last 8. Both teams are 0-4 in their last four. The Durham Bulls are still constrained by the quantity of players they can have on their roster. The Rays can go up to 40. It shows. The Rays put 21 different players on the field in Oakland yesterday — 14 batters and 7 pitchers. They were beaten, however, by WDBB favorite, former Bull Stephen Vogt, who hit a home run to go with the triple he hit a day earlier. I seem to recall, but haven’t been able to chase down, an interview with Rays’ manager Joe Maddon a few years ago where he was quoted as saying he really didn’t believe in calling up very many ballplayers when the rosters expanded. I think he said that it didn’t do either the player or the team much good. Guess he’s changed his mind. But he may have been right in the first place. The Bulls are still in the playoffs. 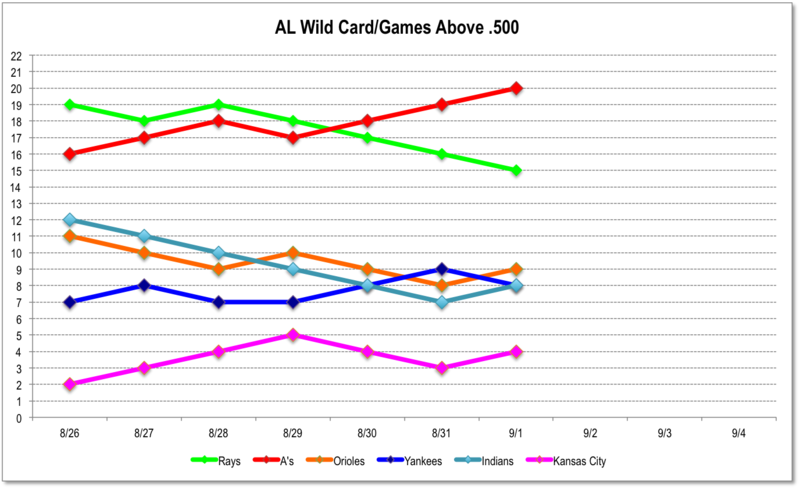 The Rays risk falling out of contention for the Wild Card. This chart shows the teams currently in the race for the American League Wild Card. The top two teams will get in this year. The Rays are fortunate that the Indians recent slide has been even worse than theirs.